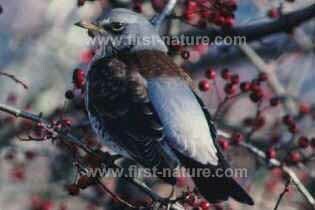 The Fieldfare, another member of the thrush family, is a winter visitor to Wales. Only occasionally is it seen in gardens, as it spends most of its time in fields or searching the hedgerows for berries. Fieldfares also eat insects, worms and grubs.